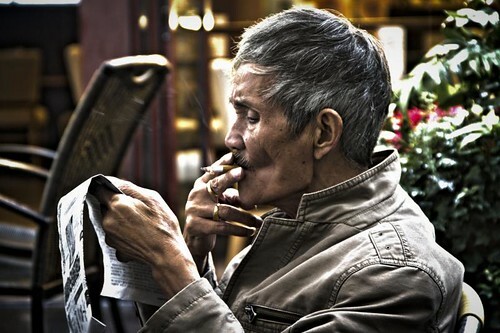 I was sitting next to this old man when the rain pored over Shanghai. He was very focused on the newspaper and the cigarette and didn´t pay any attention to me taking the photo what so ever. The photo is edited as HDR photo as I am still practicing that (for me) new technique. Sitting here together with my girlfriend under the umbrella in the rain really made me miss Copenhagen! For so many years the goal has been to explore and discover the world and everything in it! It has changed now in away… I feel more connected to Copenhagen than ever before and I am looking very much forward to get back and continue the great adventure I am living there! More post will come about the many great experiences and photos I have gotten from this trip! so stay tuned. Nice picture, I like it. Copenhagen misses you to, it just aint the same. Great, great photo! Love everything about it, the realism, the color, the unawareness of the man of you taking the picture, his hands, the way his cheeks are drawn in with the drag of the cigarette… Perfect!